With Atlantis’s early years behind her, the middle years of OV-104’s impressive career would serve to radically shift the gears of NASA’s Space Shuttle Program as the iconic vehicles gradually drifted away from solo research missions toward construction, utilization, and support of orbiting space stations. But for Atlantis, this shift in priorities would be immediate, with all 20 of her remaining missions following STS-66 revolving around MIR, the ISS, and Hubble. Following the completion of the STS-66 ATLAS-3 mission in November 1994, Space Shuttle orbiter Atlantis – known in the daily NASA processing world as OV-104 – was returned to the Kennedy Space Center on November 21 and moved into an OPF on Nov. 22. 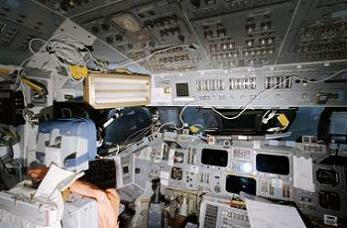 Here, major preparations and configuration changes were made to Atlantis – specifically to her internal airlock and Orbiter Docking System (ODS) to prepare her for a historic link-up in space. On April 20, 1995, Atlantis was rolled to the VAB and mated to External Tank 70 (ET-70) and SRB (Solid Rocket Booster) BI set 072 on Mobile Launch Platform (MLP) 3. 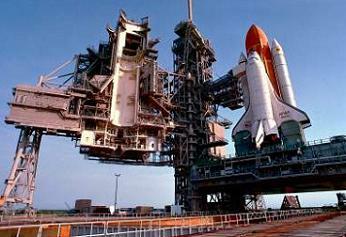 On April 26, Atlantis and the STS-71 stack was moved to LC-39A at the Kennedy Space Center. Once at the pad, launch of STS-71 was delayed behind the launch of STS-70/Discovery due to a late agreement with Russia which allowed them to launch the Spektr module to MIR so that its capabilities would be active before Atlantis arrived. On May 18, engineers decided to remove and replace (R&R) the High-Pressure Fuel Turbopump (HPFT) on Space Shuttle Main Engine 3 (SSME-3) on Atlantis. The R&R and associated retests were completed on May 25. On June 2, launch of STS-70/Discovery was postponed and the decision made to roll back that vehicle to the VAB after woodpeckers gouged over six dozen holes into the foam insulation on Discovery’s External Tank. This decision precipitated a further change in the launch schedule which once again moved STS-71/Atlantis ahead of STS-70/Discovery in the launch sequence. On June 21, during pre-launch flight tank pressurization operations, a leaking Reaction Control System (RCS) helium tank in the right hand Orbital Maneuvering System (OMS) pod was found. Technicians decided to depress the tank and R&R a fitting on the tank. A repeat leak check passed all tests and launch operations proceed toward a June 23rd liftoff. On June 23, launch controllers were prevented from beginning the loading of nearly 536,000 gallons of Liquid Hydrogen (LH2) and Liquid Oxygen (LOX) into Atlantis’s ET due to adverse severe weather within 5 nautical miles of the launch pad. Tanking was supposed to begin at 07:45 EDT. Managers delayed tanking as long as possible, but the weather did not clear in time and a 24-hr postponement to Atlantis’s launch was made. On June 24, tanking operations proceed nominally; however, bad weather continued to skirt the area. At T-9mins and holding, during the “go/no go” poll, the launch team was forced to scrub the launch of Atlantis due to heavy cloud cover and thunderstorms in the area. Because of the continued threat for bad weather over the following two days, the launch team reset the launch for June 27 at 15:32.10 EDT. On June 27, pre-launch activities proceeded nominally with a 60% chance of good weather at liftoff. During the countdown, the precise launch time was refined to maximize vehicle performance at launch. 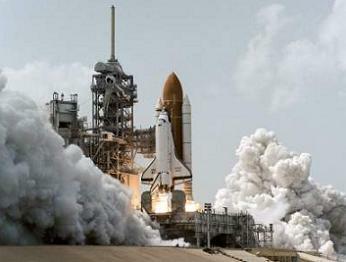 At 15:32:19.044 EDT, Space Shuttle Atlantis lifted off LC-39A to begin the STS-71 mission. 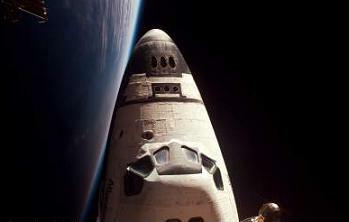 STS-71 was Atlantis’s 14th mission, the 54th space launch off Pad-A, and the 100th US Manned Spaceflight. 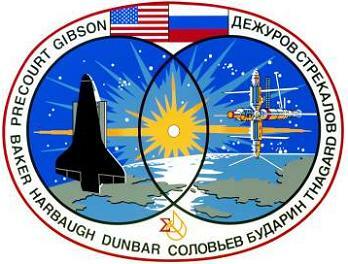 Furthermore, STS-71 marked the first of nine Space Shuttle missions to the Russian MIR space station – and the first of seven straight back-to-back MIR missions for orbiter Atlantis. 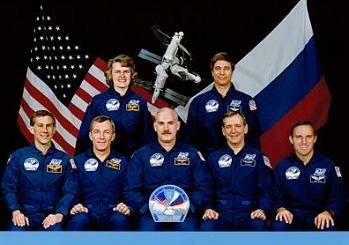 The primary objectives of STS-71 were to rendezvous and dock the Atlantis with MIR, perform on-orbit joint US-Russian life sciences investigations, perform logistical resupply of MIR, deliver two new MIR crewmembers to MIR, and return US astronaut Norman Thagard and two cosmonauts from MIR. With this, Atlantis became the first Space Shuttle orbiter to perform a direct crew rotation to the space station. At 09:00.16 EDT on 29 June 1995, Space Shuttle Atlantis performed the first-ever docking of a Shuttle to a Space Station – fulfilling a Program-long goal of using the Space Shuttle orbiters to support on-orbit Space Station operations. 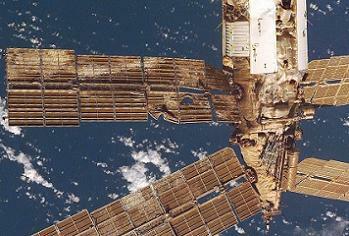 With docking, Atlantis used the R-bar or Earth radius vector approach -closing in on MIR from “below” the complex. This R-bar approach is exactly what Atlantis pioneered on her previous STS-66 mission. The R-bar approach allowed the use of natural forces the brake Atlantis’s approach to MIR more than a direct approach to MIR would have done. This allowed for minimal RCS thruster firings and the conservation of propellants. Upon docking, Atlantis and MIR formed the largest orbiting complex ever in orbit – a record which was broken on Atlantis’s next trip to MIR and then stood until the construction of the International Space Station. Over the next 5 days, over 100 hours of crew time was spent transferring equipment and performing various medical experiments. In all, over 15 biomedical and scientific experiments were performed in Atlantis’s Spacelab module with the MIR 18 crew serving as the test subjects. After the transfer completion of numerous supplies and equipment from Atlantis to MIR, and 4 days 22 hours 9 minutes and 26 seconds of docked operations, Atlantis undocked from MIR on July 4 in an event the provided – up until late May 2011 – the most iconic photograph of the Space Shuttle Program: Atlantis docked to MIR as seen from another close-range orbiting spacecraft. After 9 days 19 hours 22 minutes and 17 seconds in space, Atlantis eased onto the sunny runway at the Kennedy Space Center on July 7, wrapping up a 4.1 million mile, 153 orbit mission to MIR and returning with a Shuttle record-tying 8 crewmembers. Later that day, Atlantis was rolled into an OPF at Kennedy, where she spent three full months processing for her next mission, STS-74. On Oct. 3, she was mated to her ET/SRB flight stack and then moved to Pad-A on October 12. An investigation into previously found cracks on hold-down posts on previous Shuttle stacks was cleared at the Flight Readiness Review (FRR) on Nov. 7 and launch was officially set for November 11. On Nov. 11, the launch team monitored bad weather conditions at the mission’s Transoceanic Abort Landing (TAL) sites. With marginal conditions present at one TAL site, the decision was made to pick up the count from the T-9min and holding mark and countdown to and hold at T-5mins for final TAL weather evaluations. The weather did not meet Launch Commit Criteria and the launch was scrubbed and rescheduled for the following day. This was only the second time in history that a manned US space launch was scrubbed because of weather at an emergency landing site. 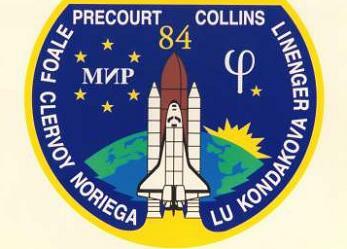 The previous occurrence was STS-61C/Columbia in January 1986. The next day, the launch countdown proceeded on schedule; however, the primary concern on this day was launch and abort weather at Kennedy, not the TAL sites. At T-9mins and holding, the “go/no go” poll revealed that all stations except one was go for launch. The SRO officer was “no go” due to RTLS (Return To Launch Site) abort weather violations – solid cloud cover below 6,000 feet. The decision was made to continue monitoring the weather and not call for an immediate scrub. With one minute of hold time remaining to meet the opening of the short launch window, the RTLS weather rules were satisfied and the “go” given to proceed. Atlantis lifted off right on time at 07:30:43.371 EST on November 12, 1995 to begin her and the Shuttle Program’s second mission to the Russian MIR space station. Liftoff of STS-74 marked the first time that representatives from the US, Russia, Canada, and the European Space Agency were in space together – four of the five primary countries responsible for building the upcoming International Space Station. On FD-3 (Flight Day 3) of the mission, Atlantis’s flight crew successfully mated the Russian-built Docking Module to Atlantis’s ODS, preparing the vehicle and its primary payload for delivery and docking to MIR. On FD-4, Atlantis completed docking operations to MIR in the early morning hours of November 15 by linking up with the MIR’s Kristall module with the Russian-built Docking Module already attached to her ODS. During the three days of docked operations, Atlantis’s crew delivered a new set of solar arrays to the station and transferred numerous experiment samples and equipment for MIR’s upkeep. The GPP payload in Atlantis’s payload bay also studied Earth’s thermosphere, ionosphere, and mesosphere during the flight. Atlantis undocked from MIR on November 18 after 3days 1hour of docked operations. She landed safely at the Kennedy Space Center, FL at 12:01.27 EDT at 8 days 4 hours 31 minutes 42 seconds of mission duration. 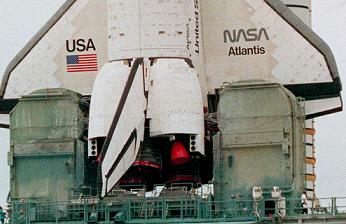 After three months in the OPF, Atlantis moved to the VAB on February 19, 1996 and then moved to Pad-B on February 28. In early March, Atlantis’s single module SPACEHAB payload was installed into her payload bay, and the payload interface verification test was completed on March 12. 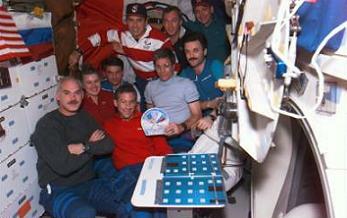 On March 11, the FRR officially set the STS-76’s launch date for March 22 at 03:13.14 EST. The 43-hour countdown with 30hrs 30mins of built in holds began on March 18 at 02:00 EDT and proceeded smoothly and without issue. 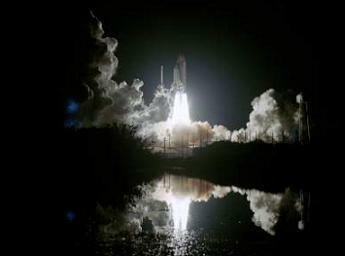 At 03:13.04 EST 22 March 1996, Space Shuttle Atlantis thundered off LC-39B at the Kennedy Space Center on her 16th mission, the 13th night launch of the Space Shuttle Program. It was also the 35th space launch from Pad-B, the 76th overall Space Shuttle mission, and the 1st Shuttle mission to use the new MCC (Mission Control Center) in Houston, TX. 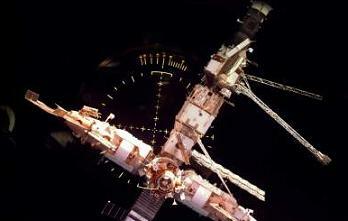 Docking between Atlantis and MIR occurred on March 23 at 21:34 EST. 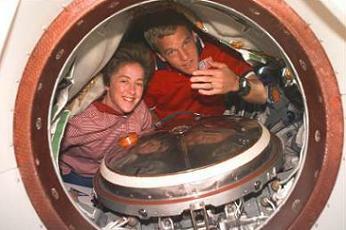 During STS-76, Atlantis delivered astronaut Shannon Lucid to MIR and transferred hundreds of pounds of supplies and equipment to the Russian space station. The European Space Agency’s Biorack experiment was also carried on SPACEHAB during this mission. Over the five days of docked operations, 1,500 lbs of water and two tons of scientific equipment were transferred to MIR. On FD-6 of the mission, Atlantis astronauts Goodwin and Clifford performed the first Shuttle/MIR spacewalk (EVA) and the first US EVA around two docked spacecraft. 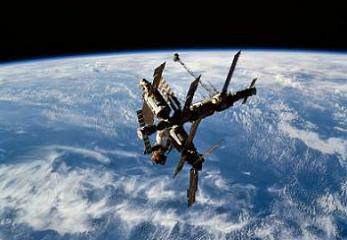 The EVA deployed the Mir Environmental Effect Payload on the station’s docking module. On March 28, managers decided to shorten Atlantis’s mission by one day to allow for a KSC landing. Atlantis undocked from MIR on March 28 at 20:08.03 EST ahead of a planned March 30 landing. On March 30, both KSC landing opportunities were waved off due to cloud formation south of the space center. Atlantis landed the following day at Edwards Air Force Base, CA at 05:28.57 PST – 11 minutes before local sunrise, making the landing a technical daytime landing according to Shuttle flight rules. On April 6, Atlantis’s ferry flight back to Kennedy was aborted 15 minutes after takeoff from Edwards when a fire warning was annunciated in the cabin of the Shuttle Carrier Aircraft. The engine that generated the warning was replaced and Atlantis was returned to Kennedy on April 12. 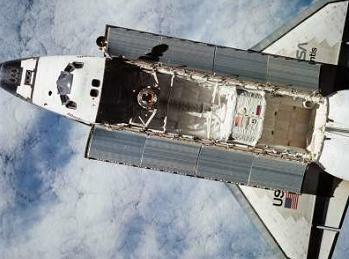 On April 15, Atlantis was moved into an OPF where she spent two months processing for STS-79. She was mated to her ET/SRB stack on June 24 and rolled out to Pad-A on July 1 for a July 31 launch date. Shortly after rollout, a hot gas path O-ring penetration on the Solid Rocket Boosters from the STS-78 launch was discovered during standard post-flight reviews. Immediately, managers began discussing the possibility of rolling Atlantis back from the Pad for repairs and inspections. On July 9, the approach of Hurricane Bertha to the Kennedy Space Center forced NASA managers to order the rollback of Atlantis for Hurricane protection. Rollback occurred on July 10. It was the 11th rollback in Shuttle Program history and the third due to Hurricane approaches. 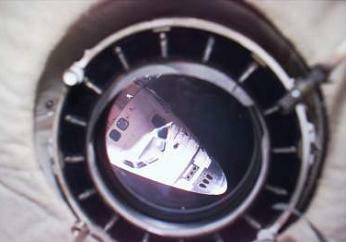 At this time, the July 31 launch date was put on hold until No Earlier Than mid-September. On July 15, NASA officially deemed Atlantis’s SRBs unsafe for flight and order her SRBs replaced. An investigation into the hot gas penetration revealed the cause to be a new adhesive and cleaning fluid mandated by new Environmental Protection Agency regulations. With this information I hand, NASA ordered the use of the older adhesive and a new SRB stack for STS-79. During replacement SRB stacking operations, Atlantis remained bolted to her now defunct ET/SRB stack in the adjacent VAB high bay. On July 25, an SRB field joint leak check between the right aft center and right forward center segments on the new SRB stack failed. 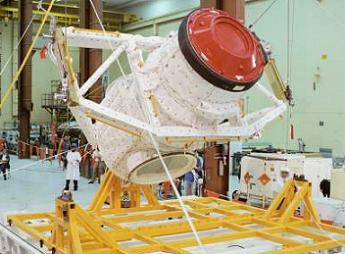 The segments were destacked and inspected. An applicator brush bristle was found on the secondary O-ring and was identified as the most likely cause of the failed leak check. 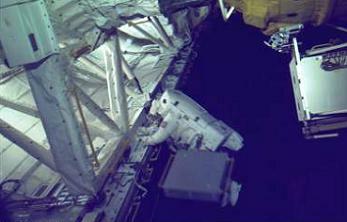 New O-rings were installed, the segments re-mated, and the leak check re-performed. The leak check was successful. SRB stacking was completed and a new ET mated to the new SRB stack. Atlantis was destacked from her defunct ET/SRB stack on August 2-3 and moved into OPF-3 for standard maintenance. On August 13, she was moved back to the VAB and mated with her new ET/SRB stack. Atlantis and the new STS-79 stack was rolled out to the launch pad on August 20, and on August 29, mission managers set Atlantis’s launch date for September 14 at the customary Flight Readiness Review (FRR). On September 3, NASA managers decided that near-by Hurricane Fran posed a significant threat to Atlantis and ordered the vehicle’s rollback to the VAB for protection. Atlantis was back in the VAB by 11:30 EDT on Sept. 4. It was the 12th rollback in Program history and the 4th for Hurricane protection. 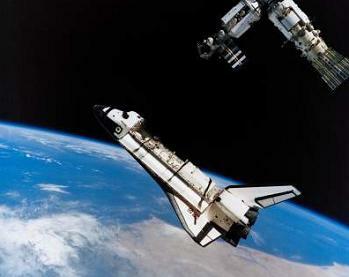 It is also the only time that a single Space Shuttle mission was rolled back twice because of an approaching Hurricane. Later that day, Hurricane Fran changed course and the threat to Kennedy and Atlantis passed. Atlantis was returned to the launch pad on September 5 by 08:30 EDT and launch was reset for September 16. The countdown began on September 14 and proceeded without issue. 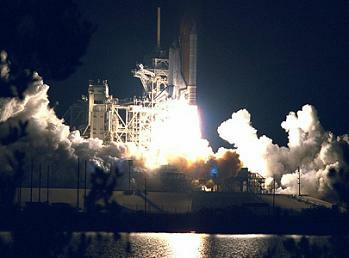 On September 16, 1996 at 04:54:49.048 EDT, Atlantis lifted off on the STS-79 mission. It was her 17th flight, the 79th flight of the Program, and the 15th night launch of the Space Shuttle. Atlantis successfully docked to MIR on September 18 at 23:13.18 EDT, making Atlantis the only Space Shuttle orbiter to dock to a completed Space Station – an honor that is hers and hers alone since the International Space Station will not be completed until well-after the final flight of the Shuttle Program. STS-79 also featured the first direct crew transfer of American crewmembers from MIR and marked the first time the SPACEHAB module was flown in a double module configuration. During the 5 days of docked operations, the MIR and Atlantis crews transferred over 4,000 lbs of supplies to MIR, including three experiments. Moreover, roughly 2,000 lbs of experiments and supplies no longer needed where transferred to Atlantis for return to Earth. This brought the total logistics transfers to 6,000 lbs – the largest ever attempted and achieved up to that point. In addition to all this, Atlantis also carried three non-transferable experiments with her that were conducted over the course of the mission. Furthermore, in an effort to reduce the risk environment for the upcoming International Space Station, the Active Risk Isolation System was flown for the very first time on this mission. Following undocking on September 23 at 21:31.34 EDT, Atlantis performed a Vernier jet firing to lower her orbit – a test of Vernier jet orbit control that could be used on the upcoming STS-82/Discovery mission to boost the Hubble Space Telescope’s orbit. 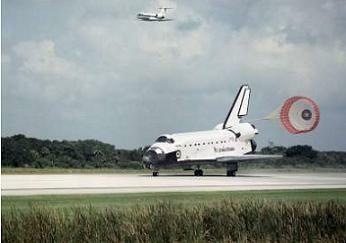 After 10days 3hrs 19mins 28secs, Atlantis landed safely at the Kennedy Space Center at 08:13.20 EDT on Sept. 26. She was moved into OPF-3 that day and spent 2months and one week processing for her next mission. On December 5, she was moved to the VAB and then out to Pad-B five days later on Dec. 10. 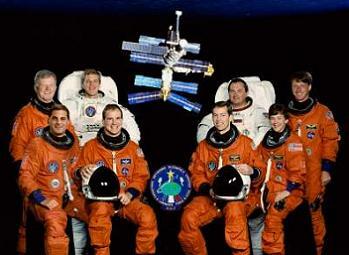 On January 6, 1997, the FRR set the launch date for STS-81 for January 12. The launch countdown proceeded flawlessly and Atlantis lifted off right on time at 04:27.23 EST for her 18th mission, the 81st for the Shuttle Program, and the 16th night launch of the Shuttle. 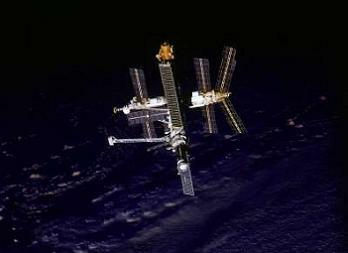 Docking occurred at 22:54.49 EST 15 January and was the 5th Shuttle/MIR docking. Atlantis again carried the SPACEHAB double module which allowed for the transfer of nearly 6,000 lbs of logistics to and from MIR. The mission broke the old Atlantis record for amount of materials transferred between two spacecraft during a single joint mission, and Atlantis became the first space vehicle in history to return with plants that had completed all of their growth – an entire seed-to-seed growth phase – in space. During the mission, Atlantis’s crew performed several experiments in advanced technology, Earth sciences, biology, human life sciences, microgravity and space sciences to further planning and utilization operations on the upcoming International Space Station. The joint crew also tested a Treadmill Vibration Isolation and Stabilization System that would one day be used to develop the treadmills for the International Space Station. 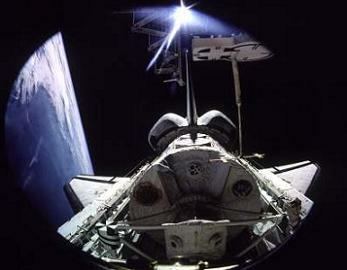 Following on from her post-undocking Vernier thruster firing test on her pervious mission, Atlantis fired her Vernier thrusters while docked to MIR to test Shuttle Vernier thruster ability to boost a space station’s orbit – something that would eventually be used for International Space Station flights. Atlantis undocked from MIR at 21:15.44 EST on January 19 after 4 days 22 hours 20 minutes 55 seconds of docked operations. Landing occurred at the Kennedy Space Center on January 22, 1997 at 09:23.50 EST after 10days 4hours 56minutes 27seconds in space. After three months in OPF-3, Atlantis was moved to the VAB on April 19 and mated with her ET/SRB stack for the STS-84. After arriving at LC-39A on April 24, Atlantis sailed through pad processing. The 43-hr countdown began at 2300 EDT 11 May 1997 and debuted a new 40-minute extended hold at the T-9min mark to provide extra cushion in the final minutes before launch to ensure that the launch team could execute a proper and as-stressless-as-possible launch within the extremely short launch window for MIR missions. The extended T-9min hold would become standard for all subsequent MIR and ISS launches. Liftoff of Atlantis and STS-84 occurred on May 15, 1997 at 04:07.48 EDT and represented the 19th flight of Atlantis, the 84th Space Shuttle mission, and the 18th night launch of the Space Shuttle Program. 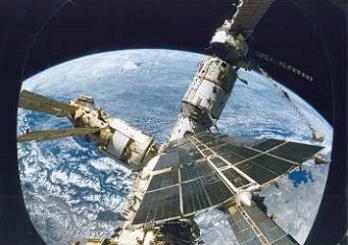 Docking between Atlantis and MIR occurred at 22:33.20 EDT 16 May over the Adriatic sea. Over the course of the 5-day docked mission, Atlantis’s crew transferred 7,310 lbs of water and supplies to and from MIR – again setting a record for the amount of supplies transferred between two vehicles. The mission also conducted Biorack facility experiments, a photo survey of MIR, environmental air samplings, and radiation monitoring. After 4days 22hrs 30mins 36sec of docked operations, Atlantis departed MIR. However, unlike previous Shuttle/MIR missions, Atlantis did not perform a flyaround of the complex. Instead, she performed a series of three “stop” maneuvers to halt her departure from MIR in order to test a European sensor device for future rendezvous operations for a proposed European Space Agency resupply vehicle for ISS. That vehicle would come to fruition as the Automated Transfer Vehicle – which has made two successful trips to ISS to date. After 9days 5hrs 20mins, Atlantis landed safely at the Kennedy Space Center at 09:27.44 EDT on May 24, 1997 after 145 orbits of Earth. Later that day, she was moved into an OPF for immediate post-flight deservicing, which lasted through April 8. She was then moved into the VAB for storage – at which point she gained control of the STS-86 mission, another flight to the MIR space station which had originally been assigned to her sister Endeavour. On May 24, she was moved into OPF-3 for pre-flight processing. On August 11 she was moved into the VAB and mated with her flight tank and booster stack. The entire STS-86 stack was moved to Pad-A on August 18. On September 25, NASA Administrator Dan Golden completed a MIR safety review following the collision of a Progress vehicle to the station and gave the official go ahead to proceed with the launch of STS-86 and astronaut Dave Wolf’s stay on MIR. Tanking of Atlantis began one hour later than planned because of a software glitch in the launch control center, but the countdown otherwise proceeded nominally. 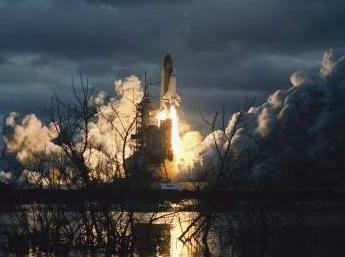 At 22:34.19 EDT on September 15, 1997, Atlantis lifted off on the STS-86 mission. It was her 20th flight, her 7th straight mission to MIR, the Shuttle Program’s 87th mission, and the 19th night launch of the Shuttle Program. 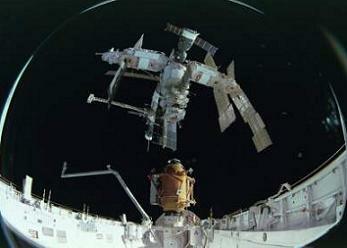 Docking of Atlantis and MIR occurred at 15:58 EDT on Sept. 27. In addition to the transfer of a MIR crewmember and thousands of pounds of supplies and experiments, Atlantis’s STS-86 mission featured the first joint-US/Russian spacewalk (EVA) during a Shuttle mission. Atlantis’s commander also fired the vehicle’s thrusters during docked operations to provide Mir Structural Dynamics Experiment data which was designed to measure disturbances to space station components and solar arrays. After closing hatches between the two vehicles, Atlantis bid farewell to MIR for the last time at 13:28.15 EDT Oct. 3, 1997 after 5days 21hrs 30mins and 15secs of docked operations. Landing on Oct. 5 was waved-off due to unacceptable weather at the Kennedy Space Center. 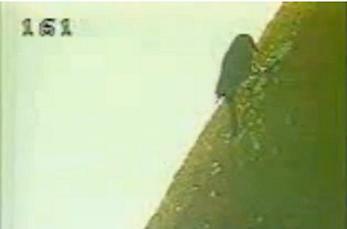 Landing occurred on Oct. 6, 1997 at 17:55 EDT, ending Atlantis’s 10day 19hr 22min 12sec mission to MIR. This was Atlantis’s final mission before she was taken out of service for another Orbiter Modification Down Period. Atlantis would not fly again until May 2000 when she made her first trip to the International Space Station. PART III of Space Shuttle Atlantis’s tribute will be published on Monday. (All article images via L2 Historical’s huge collection of Hi Res (larger than desktop size, average 3mb each, many scanned and restored from hard copies) images, videos, MER reports, etc. For nearly every mission – over 500 gigabytes an growing just for the historical database. All images used in this article are associated with the mission the article references, via L2’s image database – Click here to Join L2 http://www.nasaspaceflight.com/l2 ).